This Sci-Plus Series 2300 is an easy to use, fully portable, talking, large display calculator set in oversized color coded, positively activated keys. The Sci-Plus series 2300 are the only scientific calculators designed specifically for users with low vision. 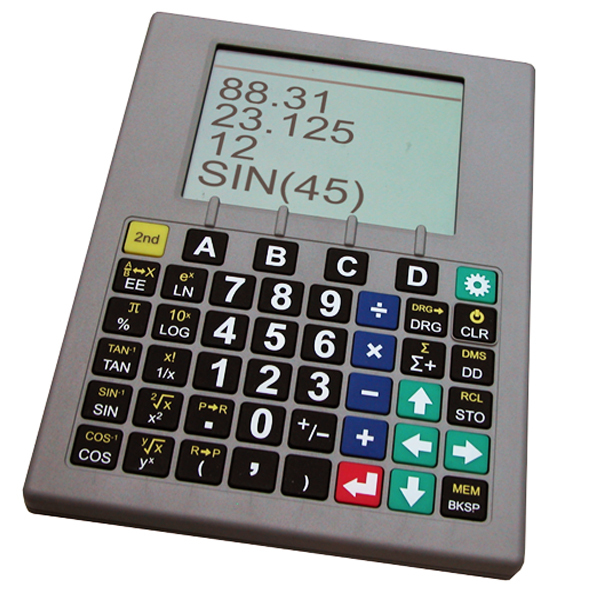 The SciPlus-2300 performs scientific, statistical and trigonometric calculations, and fractions. It also has adds the ability to evaluate functions, and includes a speech output via earbuds (included). * Large four-line graphical display with selectable contrast. * Adjustable display backlight for operating in low-light conditions. * Long life battery, rechargeable through USB (country specific USB charger included). * Large print user’s manual. * Available in silver or blue.